These new facilities work just like the existing facilities for comparisons of means, proportions, correlations, and variances. 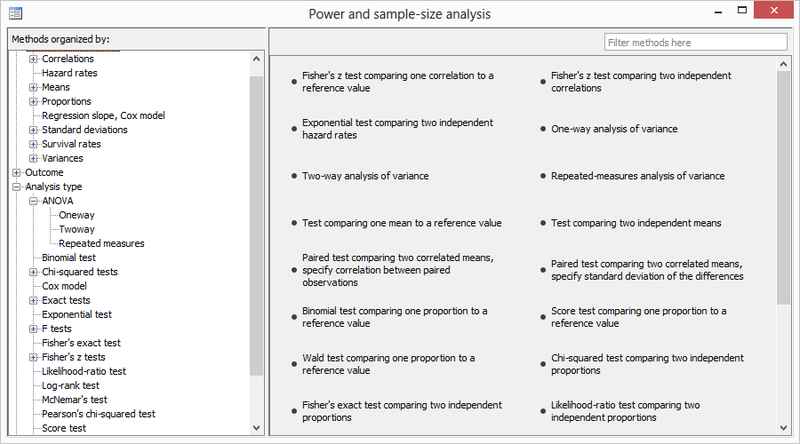 You can specify single values or ranges of values for power and effect size to compute required sample size. You can specify sample size and effect size to compute power. Or you can specify power and sample size to compute effect size. Your results can be displayed either in tabular form or as a graph. Multiple scenarios can be compared on a table or a graph. 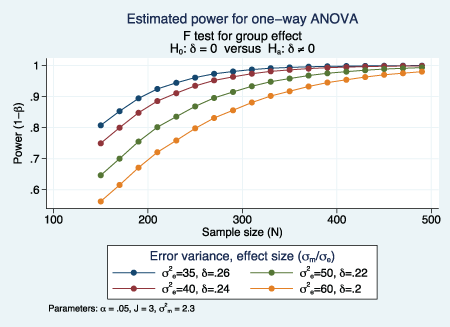 For one-way ANOVA, you can perform analyses either on comparisons of means or on arbitrary contrasts of means. All methods work with unbalanced models. You can specify your problem in the way you find most convenient. For example, to compute the required sample size for a one-way analysis, you can specify the projected group means directly, or you can specify between-group variability. power oneway will accommodate either of these specifications. You can perform your analysis using either natural command syntax or the integrated power and sample-size control panel—a graphical interface to guide you through your analysis. Stata 13.1 also introduces facilities to easily add your own new methods to the power command and produce tables and graphs of results automatically. Read about all the new features provided for power and sample-size analysis in Stata 13 and 13.1. You will find highlights and a quick overview of the new features, links to videos, links to worked examples, and even a PDF of the new Power and Sample-Size Reference Manual.